Waratahs 17 Lions 47: The Lions impressively maintained their unbeaten record on this tour with a record winning margin in 21 meetings with the Waratahs, running in five tries to two as a host of players appeared to nail down their test spots at a packed and vibrant Allianz Stadium. But the win came at what appeared a very significant cost when Jamie Roberts walked off very gingerly with what looked very like a torn hamstring, thereby placing a cloud over his participation in the rest of the tour, not just in the first test in Brisbane next Saturday. The Lions could, therefore, be denied three of their first choice three-quarter line in the shape of Roberts, Tommy Bowe and, possibly, the hamstrung Geoge North. Of minor consolation was the excellent performance of Jonathan Davies, but he Lions’ midfield plans have been thoroughly disrupted. Leigh Halpfenny scored 30 points, a record by a Lion in Australia, when augmenting his latest eight from eight haul with the boot with a brace of tries. He has now kicked 22 out of 23 on tour. Who will be the wings is another question, as Simon Zebo hit the ground by providing strength in the air, pace, workrate and an X factor which Sean Maitland couldn’t match. Up front the lineout maul went well and Alun Wyn Jones’s big game (nine carries, seven tackles and three lineouts) alongside the equally impressive Paul O’Connell, assuredly confirmed their test partnership as, most probably, did Tom Croft alongside Sam Warburton, excellent in his fringe defending, and Jamie Heaslip. Tom Youngs was also excellent in the loose. 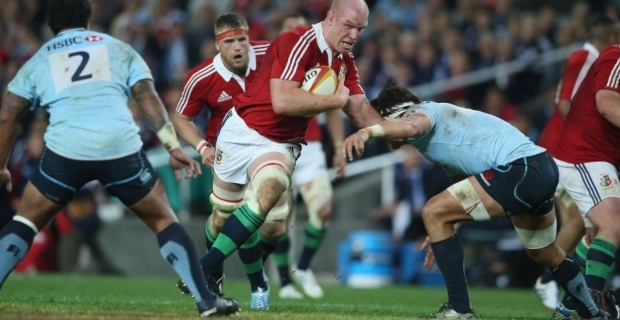 The Lions weren’t without their flaws, scoring five but conceding two tries and making a dozen turnovers. At times their backline was a little too flat and Mike Phillips wasn’t quite himself, though Jonny Sexton was outstanding, and they were counter-rucked a little too easily for comfort some times. Blue flags having been commissioned free before the game, the vibrant mix of blue and red in a 40,805 Saturday night Sydney crowd underlined that this was not a place for neutrals any more than it was for faint hearts. Warren Gatland would have relished the way the home players threw themselves into huge tackle after huge tackle almost as much as Michael Cheika did, although he might have had more than a few concerns about the way that some of them were clearly targeting Jonny Sexton. Sexton was the master puppeteer in an electrifying start which emulated the opening salvos from the Reds a week before in Brisbane. The Lions might have had a try in the first minute after Sexton worked a sweet right to left move in what had seemed a narrow channel to put Jonathan Davies into space and he in turn released Simon Zebo for a gallop up the touchline. His left boot, however, brushed the touchline moments before grounding the ball in a superb covering tackle by Drew Mitchell. Mitchell would also save a try in the opposite corner but by then the Lions had deservedly drawn first blood, with Sexton instigator and finisher of a counter-attack around halfway, first passing wide to Zebo, who fed Jonathan Davies. The Welshman cleverly took out two men on the outside before passing inside for Sexton, who took a trademark trailer, to finish it off from the 22. Halfpenny knocked over the touchline conversion, as he does, to augment an earlier penalty, but five minutes later the Lions were caught napping, admittedly as Sexton was being treated after a late hit by home lock Will Skelton. After Zebo had been tackled into touch, from a quick throw Bernard Foley crosskicked for Peter Betham to gather and beat Sean Maitland on the outside, before passing inside for Tom Carter to score; Brendan McKibbin converting from the touchline. Halfpenny quickly tagged on a couple of penalties either side of Mike Phillips denying Skelton a try from a quick throw and there ought to have been further reward after a wonderful take by Zebo from Phillips’ box kick before the latter was blocked after chopping Cam Crawford. Instead, the Lions messed up the attacking scrum, and McKibbin made it a one-score game again with a penalty before the Toulon-bound Mitchell, easily the ‘Tahs’ best player, released Crawford by beating Croft and offloading underarm, before a few phases later Croft won the relieving turnover penalty off Dave Dennis. The Lions patiently went through the phases off a lineout maul, Alun Wyn Jones injecting go-forward by pumping legs and quick hands by O’Connell as first receiver enabling Sexton and Davies to put Halfpenny over. Within four minutes of the restart the Lions generated a complete team try, again off a lineout maul, as the forwards punched onwards from close in before Sexton worked a clever midfield triangle with Roberts coming hard on to his beautifully delayed pass and offloading inside for Davies to then link with Halfpenny. The fullback again converted his own score for a rapid-fire 14 point salvo in five minutes either side of half-time championship minutes. Annoyingly for the tourists, Skelton peeled off a close-in lineout for Carter to score again with an unstoppable line which not even Sexton and Heaslip could deny, but Halfpenny landed another penalty before Davies picked off McKibbin’s pass. From the recycle, good hands by Farrell, Maitland and Halfpenny saw Croft gallop home brilliantly with a hand-off. Despite being down to 14 men after emptying the bench on the hour following Roberts’s departure, the Lions had the final say through Davies when he was put away by Ben Youngs after the scrumhalf’s own snipe and tidying up by O’Connell. Scoring sequence: 4 mins Halfpenny pen 0-3; 6 mins Sexton try, Halfpenny con 0-10; 15 mins Carter try, McKibbin con 7-10; 19 mins Halfpenny pen 7-13; 26 mins Halfpenny pen 7-16; 40 mins Halfpenny try and con 10-23; (half-time 10-23); 44 mins Halfpenny try and con 10-30; 46 mins Carter try, McKibin con 17-30; 52 mins Halfpenny pen 17-33; 55 mins Croft try, Halfpenny con 17-40; 72 mins Davies try, Farrell con 17-47. Waratahs: Drew Mitchell (Randwick); Cam Crawford (Northern Suburbs), Rob Horne (Southern Districts), Rob Horne (Southern Districts), Tom Carter (Sydney University), Peter Betham (Sydney University); Bernard Foley (Sydney University), Brendan McKibbin (Eastern Suburbs); Jeremy Tilse (Sydney University), John Ulugia (Eastern Suburbs), Paddy Ryan (Sydney University), Will Skelton (Sydney University), Ollie Atkins (Sydney University), Jed Holloway (Southern Districts), Pat McCutcheon (Sydney University), Dave Dennis (Sydney University, captain). Replacements: Tom Kingston (Sydney University) for Carter (48 mins), Lopeti Timani (Southern Districts) for Holloway (50 mins), AJ Gilbert (Northern Suburbs), Matt Lucas (Manly) for McCutcheon (55 mins), Luke Holmes (Warringah) for Ulugia, Richard Aho (Randwick) for Tilse, Sam Talakai (Sydney University) for Ryan, Ben Volavola (Southern Districts) for Betham (all 73 mins). British & Irish Lions: Leigh Halfpenny (Cardiff Blues/Wales), Sean Maitland (Glasgow Warriors/Scotland), Jonathan Davies (Scarlets/Wales), Jamie Roberts (Cardiff Blues/Wales), Simon Zebo (Munster/Ireland); Jonathan Sexton (Leinster/Ireland), Mike Phillips (Bayonne/Wales); Mako Vunipola (Saracens/England), Tom Youngs (Leicester Tigers/England), Adam Jones (Ospreys/Wales), Alun Wyn Jones (Ospreys/Wales), Paul O’Connell (Munster/Ireland), Tom Croft (Leicester Tigers/England), Sam Warburton (Cardiff Blues/Wales, capt), Jamie Heaslip (Leinster/Ireland). Replacements: Owen Farrell (Saracens/England) for Sexton (50 mins), Richard Hibbard (Ospreys/Wales) for T Youngs, Alex Corbisiero (London Irish/England) for Vunipola, Dan Cole (Leicester Tigers/England) for A Jones, Geoff Parling (Leicester Tigers/England) for O’Connell, Dan Lydiate (Dragons/Wales) for Croft, Ben Youngs (Leicester Tigers/England) for Phillips, Rob Kearney (Leinster/Ireland) for Halfpenny (all 60 mins).